The name speaks for itself – The Hangout is literally the place to hang out. Located directly on the beach, this open-air, family-friendly restaurant marvels all ages; but declaring this place as a restaurant is simply an understatement – it’s an entertainment checkpoint, a souvenir palace and a child’s paradise. Whether you come for heaping amounts of Gulf Coast seafood or to enjoy live music, it’s quite easy to spend hours here during your beach vacation. There’s an ample amount of seating available inside or outside. You can sit in the enormous dining room to watch live bands and football games, lounge outside in the hammocks and soak up the sun, or enjoy the best of both worlds and sit at the inside bar positioned by the gaping windows, which affords phenomenal views and a lovely Gulf breeze. A tip from the locals: let your kids play in the sandpit outside and kick-back at a table by a window to keep an eye out for them. Regardless of where you sit, you’re in for a treat because the menu is nothing short of seafood bliss. The colossal portions will satisfy all your Gulf Coast cravings with dishes like freshly shucked Gulf oysters, shrimp and grits, or our personal favorite, the Fried Seafood Platter – a combo of fried crab, shrimp and oysters. Healthy? No. Tasty? You better believe it. According to one of our beach life mantras: a delicious meal on a sunny day is never complete without an ice-cold beverage. And there’s not a better place to enjoy a drink or two than relaxing outside at the cantina bar or around the cozy fire pit. When you’re feeling good you can dance along to the live music on the outside stage. Not only does their backyard please the adults, but the little ones are certain to experience nirvana when they get to play in the sand playground or run around catching bubbles from the foam machine! You’ll always find a good amount of buzz going on at The Hangout. They regularly host live music and highly anticipated, entertaining events including the annual Oyster cook-off and their nationally renowned event Hangout Music Festival, a three-day beach bash on the white sand. Over the past few years, some of the industry’s greatest musicians have hit the stages, including the Red Hot Chili Peppers, Stevie Wonder, Dave Matthews Band, The Foo Fighters, along with dozens of notable supporting acts. The festival attracts more than 35,000 music junkies who come together to experience an unforgettable weekend bursting of music, sunshine and dancing. Tickets sell out every year! Not only will you create a boatload of memories, but you can also take memories with you. Their fully stocked gift shop offers fun souvenirs ranging from tie-dyed tees and flip-flops to beach balls and hammocks. Be sure to bring your camera because there are perfect photo ops for the whole family – especially their giant wooden beach chair outside and their well-known ‘hang-loose’ statue. A vacation to Orange Beach isn’t complete without a trip to The Hangout. So come hang out, enjoy some great food, listen to live music and let the good times roll. 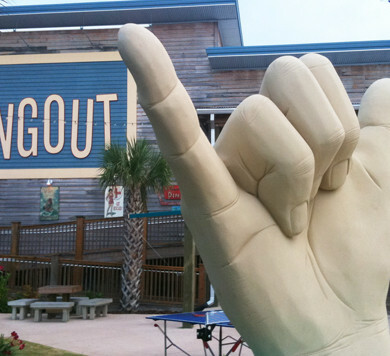 The Hangout is located at 101 E. Beach Boulevard in Gulf Shores, AL. For more information, visit the Hangout website or call (251) 948-3030.